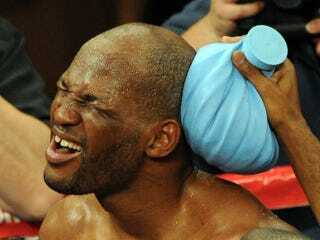 • Bernard Hopkins didn't lose a fight last night, but lost in his bid to break George Foreman's oldest-to-a-belt record. (This judge — who didn't use whiteout — scored it at 114-112 Hopkins, being a homer that excused one of two official knockdowns as donkey-punch related). North Philly represented after a slow start [The Ring]. Rematch requested [Fanhouse]. • The Miami Heat trailed the Washington Bullets (aka Wizards) by five points with 32.6 seconds. The Heat won by one [Miami Herald]. The Bullets (aka Wizards) also traded Gilbert Arenas to the Orlando Magic [Orlando Sentinel]. The Magic proceeded to get roughed up by the Philadelphia 76ers, who revel in playing teams with depleted rosters [Philadelphia Inquirer]. • Inter Milan wins the FIFA Club World Cup by dispatching African upstart TP Mazembe 3-0. This leads to unrest in Lubumbashi. Reports say disappointed fans took to the streets and attacked Chinese-run businesses, after TP Mazembe were beaten 3-0 by Italian club Inter Milan. • And, finally, from the "Hickey's Biased" coverage files … The Philadelphia Flyers are the "best and deepest team in the East" [New York Post]. Kobe still can't get no love in the 215, but Michael Vick sure can [FoxSports Southwest]. It's onward to the Jan. 7 FCS championship game for the mighty University of Delaware Fighting Blue Hens [News Journal]. Welcome back. So happy you could join us.